Maybe a strange combination….maybe not….A few of my favorite colorful inspirations for the week. I saw this awesomely whimsical, right up my alley harbor decor idea on Apartment Therapy this week. LOVE IT! The big question for me….does the inside show…or the BOTTOM? 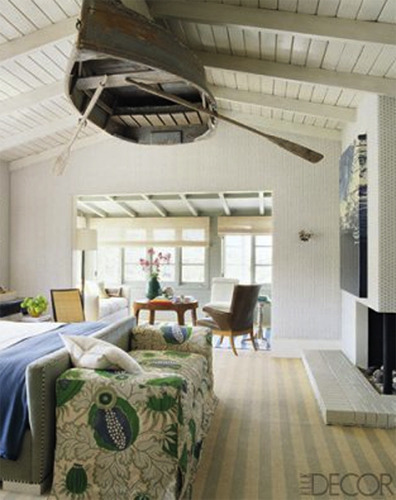 I have the perfect boat in mind for my ceiling. I can find it on Martha’s Vineyard! 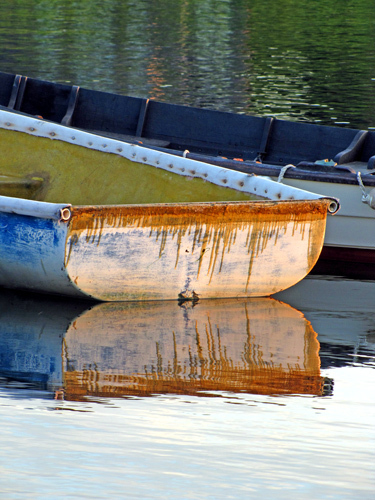 A favorite boat on Martha's Vineyard! 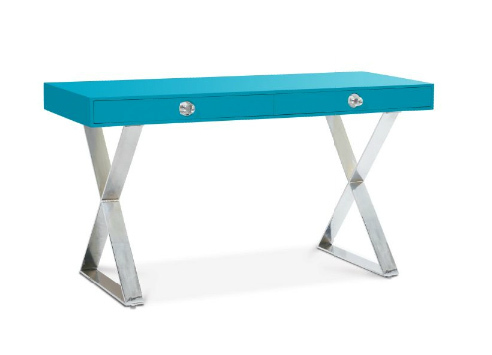 Jonathan Adler has a new limited edition furniture collection. I’ll take these two for my next home office. Punctuate with some orange accents (like an orange Moroccan pouf…also available from Jonathan Adler) and my creative life will be completely fulfilled! And finally, this is definitely my favorite color of the week. This wall paint has my name written ALL over it! HEAVENLY! Interestingly enough, they would all go nicely in a house together. THAT was a coincidence. I hope you are having a colorful week and are finding your color inspiration in the world around you! Tuesday we toured some colorful workplaces from around the web. 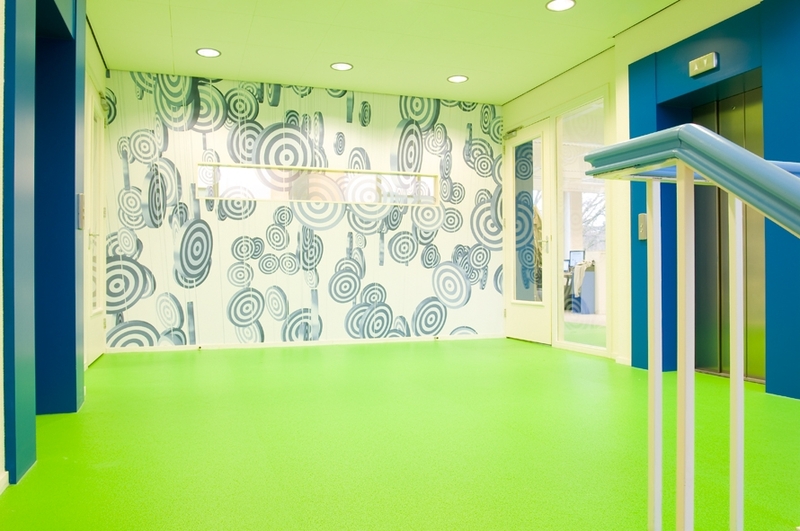 Now let’s look at how we can bring some fun into our own offices and workday. Of course there is furniture. Remember that GREAT office with the colorful art and lunchbox bookcase? Well, I’m still in love with it but I still want to change something. I’d like a different chair. Perhaps one of these. I LOVE these chairs from Community Furniture. I’m not sure which one I’d get…surprisingly the turquoise is not my quick selection. Orange is tempting. But then there is the purple. I feel like the color energy would seep into me as I sat and I’d be the most creative chic on the block. I might even get a reputation… What color are you creating from? Have a bookcase in your office? Dress it up! I’ve always loved this next idea. Put wallpaper remnants, contact paper, favorite photos or anything colorful behind the shelves like the dining room feature shown below. A fun DIY to tackle this weekend. 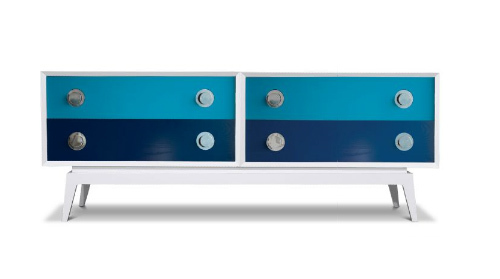 You can also paint the back panel with a bright color (or 2 or 3) to add some fun color pop like the living room piece shown on Decor Arts Now. If you’re feeling really creative, do a little of both! Mix it up. 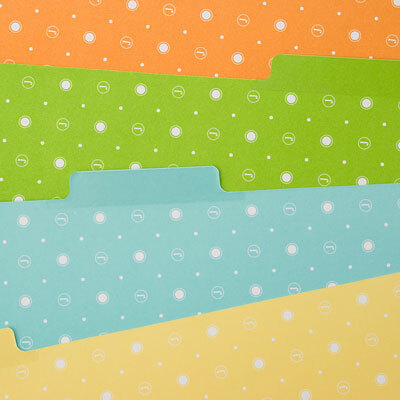 Decorate some shelves with a patterned paper and keep some a solid color! After furnishings, we need accessories. Check out See Jane Work. 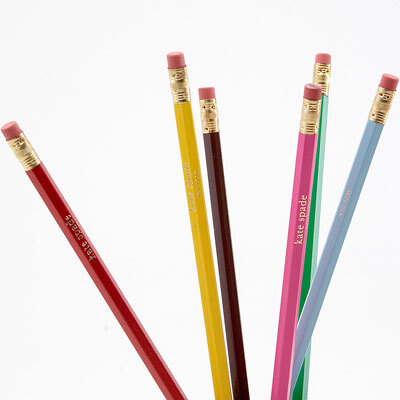 There is no shortage of fun colorful office supplies on this website. I could buy one of each! But, I did have a few favs. 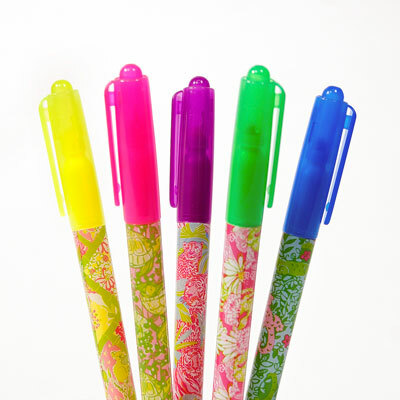 Lilly Pulitzer Highlighters for feeling fresh and girlie. OH, YES! 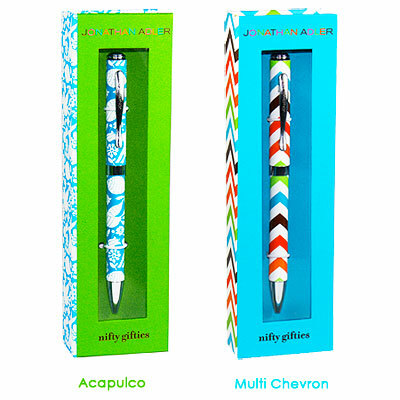 Jonathan Adler pens? I’ll take a case of these!! We’ve got favorite designers “at our fingertips”! When we’re done writing, and drawing, and coloring, and highlighting, and doodling…..we”ll need to organize some things. A few not so boring folders! When Spring FINALLY arrives, we might want to tear ourselves away from our beautiful offices and take some work to the park. PERFECT! 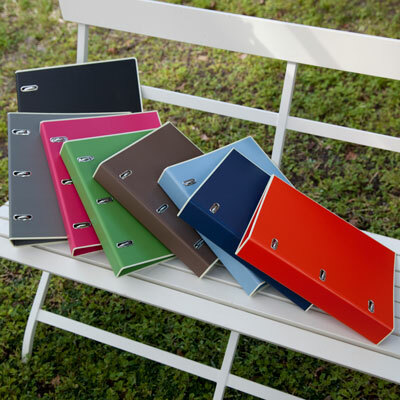 We can take our work and our color with us with these binders. 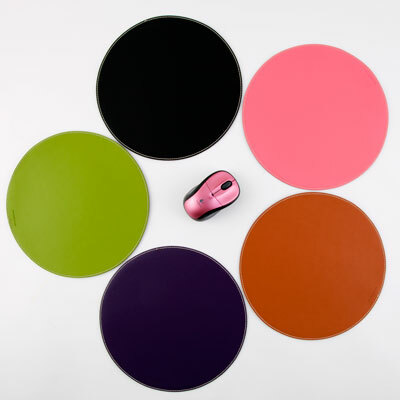 All this blog activity, Facebooking, Tweeting, and work…right there is work to be done…is wearing out our mouse pad. I’ll take the Bella Leather Mousepad in Pink, PRETTY PLEASE. And since our office is now so pretty and organized we’ll need to tackle those unsightly cords. No problem! 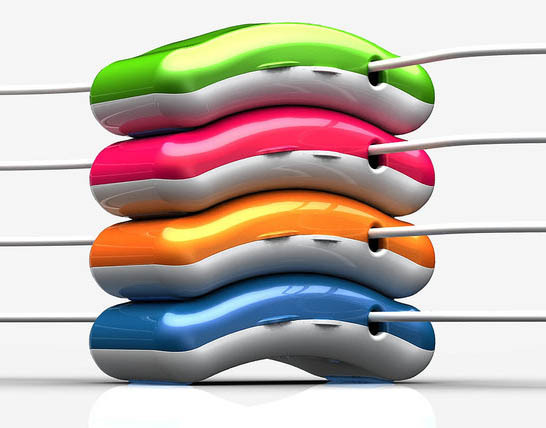 These retractable cord keepers I found at Style At Home keep us colorful and neat! I’m almost done with my office…but there is something missing. What was it?? Lighting – Right! Kelley Moore envy means I need one of these! The chandelier that is. My new goal: Office with a chandelier. We’re done! We decorated our office. We’re surrounded by color and ready to create a magnificent day. Let’s get to work! It’s no secret I love color. It’s what this whole blog is about basically. But, I have a confession to make. My workspace is drastically lacking in color! I keep thinking I’ll do something about it. Paint a dramatic color on the wall, buy some fun bookshelves and paint each shelf a different color or line the back of the shelves with different colors and patterns of wallpaper, and get some fun desk accessories. But, I’m still “waiting” on something to motivate me and dreaming of what it “could be”. The other day I saw some inspiring pictures of creative and color offices and it re-awakened my vision of “working with color”. 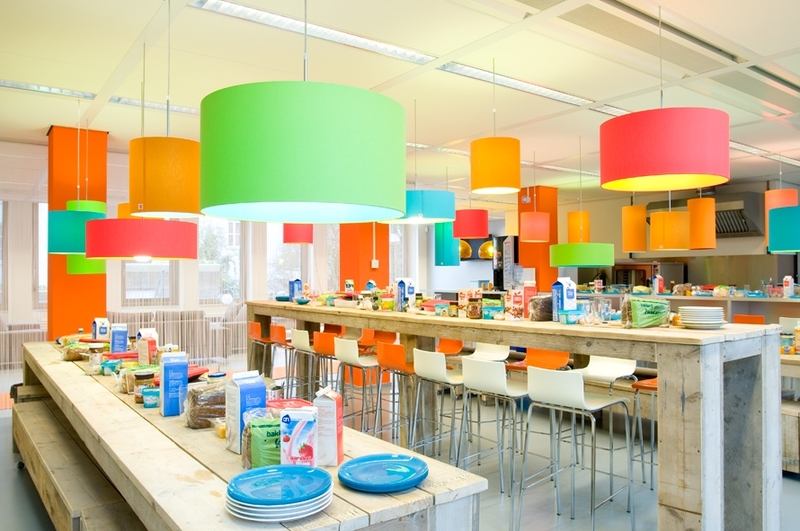 How fun would it be to work for these companies and spend your day in these offices? I think this is the lobby. 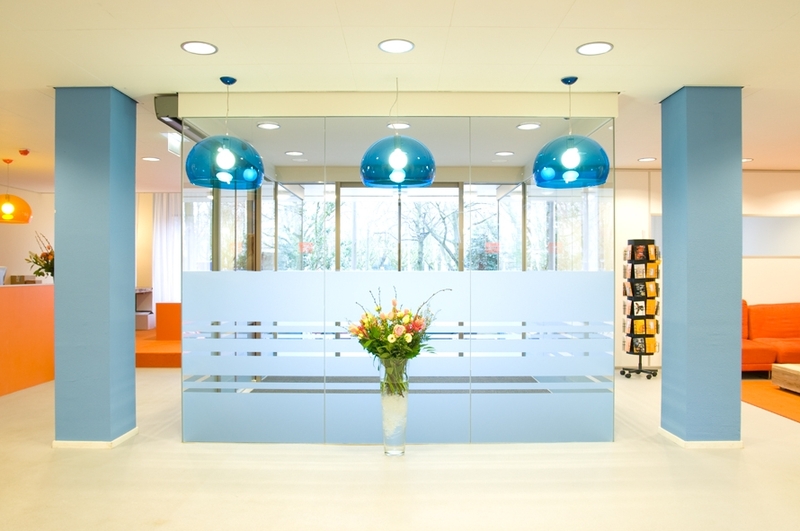 Coming to work every day and seeing a burst of blue and orange could never be a bad thing! WHAT? Is this a lunch room? An art room? Whatever it is, LET ME IN!! These circular lamps make me want to jump right in! The stairwell…well, I’ve got 1/2 color love and 1/2 photographer envy going on. I LOVE taking fun pictures of stairs! 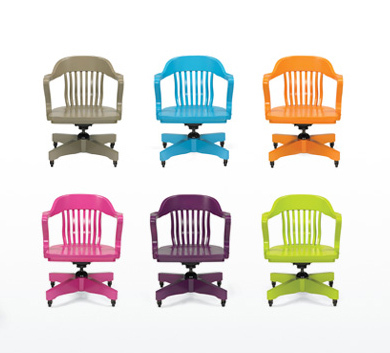 Here’s a fun example of a colorful office you could have in your home. I love the art on the walls. You could make your own with markers or pastels. I know because when I’m not taking pictures, I’ve been experimenting with pastels and have made some of these square on square shapes. The bookshelf with the lunch boxes is GENIUS! A practical storage solution and color CUTE!! If this were my office they would be filled with camera gear, crayons, markers, paint brushes, and pastels. I’d work in here any day, all day! I’d only change one thing (come back Thursday to see what). This is what it looks like to work in the Lilly Pulitzer studio. Pink, paint, textiles…I think I’ll submit my resume tomorrow!! 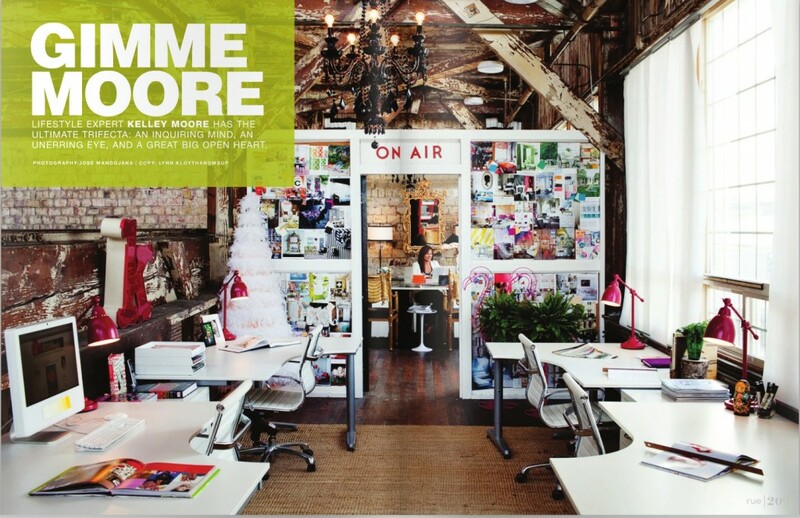 Lifestyle expert Kelley Moore’s offices look amazing also. A loft, color, brick walls, chandeliers? Maybe I should send a resume here too. Delicious! I could go on, but I’ll stop here. You probably need to get to work. 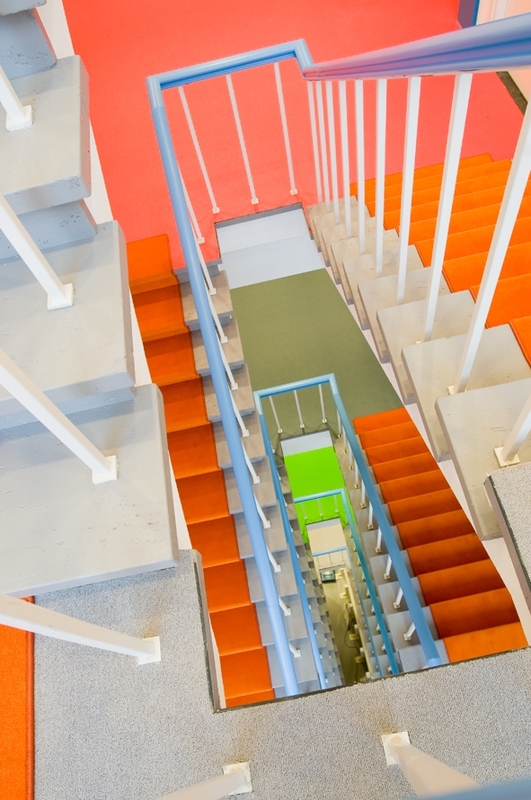 If your office isn’t quite as creative and colorful as these, it’s OK. You aren’t alone. But you can grab some markers or pastels and put your OWN color to work for you. After all, creativity is for EVERYONE! And so, I say, is COLOR! 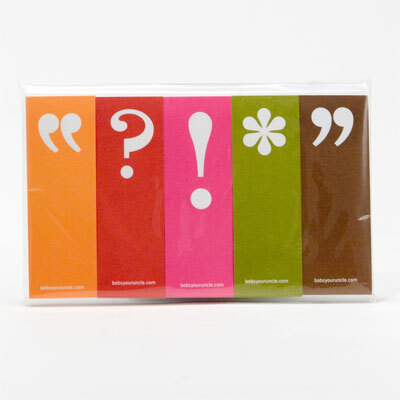 Wednesday I’m launching a new “theme day” and Thursday I have some great office accessories to share, colorful ones of course, that will also add some color to your work space. Come back and check them out!